Where do you like to practice yoga? Personally, I love a big yoga class or, of course, a festival-type scenario. I like the energy that comes from being one with the crowd, from being a part of something bigger. But … I also can’t deny my appreciation of less-crowded classes and small studios. While some people crave and require the energy a large studio with packed classes brings to the mat, a small yoga studio presents many advantages to a yogi. In a small studio, chances are you’ll attend a small class. While some may find this a bit unnerving, personal attention from the yoga instructor can be great, especially for those just starting out on their yoga journey. With a smaller class size, you can benefit from an often more relaxed environment in which you feel able to ask questions. And, as a total bonus, occasionally you’ll be the only one who shows up for a certain class, thus treating yourself to personal instruction. That’s the best. When you’re in a small class, your teacher is often always visible. You’re not in the sixth row, craning your neck around someone else to see the new position your teacher is walking you through for the first time. And you can see all of your teacher: foot positioning, leg angle, stacked shoulders—the complete pose and her movement. You can hear your teacher clearly above the other students’ mindful breaths. Seeing and hearing your instructor can help you land your poses correctly the first time, instead of six or seven crowded classes later when you finally receive an adjustment. In a packed class, if it’s hard for you to see your teacher, it’s probably hard for her to see you, too. But in a small class your yoga instructor can easily see when your triangle pose isn’t opened quite right. She may not even need to come make a personal adjustment, though she can and often does in a small class. Instead, she may just state from the front of the class a common mistake in the pose, causing you to realize your error and make the adjustment on your own. A good yoga teacher will know what kind of adjustment you prefer once she gets to know you in a small class setting. Practicing in a smaller studio makes it easier to forge a personal connection with your yoga teacher—and for her to do the same with you. By seeing you regularly in an intimate class setting she’ll know your strengths and weaknesses. She’ll be able to see you struggle with balance poses but have the best downward dog in the class. Beyond your practice, she’ll get to know your personal side and what you do between yoga classes, like training for a marathon, chasing children, or teaching on your feet all day. A great yoga instructor will provide advice and know what to add to the class to help you feel your best. In a big studio you’re more likely to sit down on your mat and stretch out quietly before class starts. Large classes can be intimidating environments to try and make new friends, with unfamiliar faces buzzing about and many already paired off with yoga buddies. But when it’s just you and one other person in the studio, it seems rude to not introduce yourself and share a few bits of info. It feels great to connect with fellow yogis. Who knows, you might just meet your best new yoga friend in class. Why not invite her out for a smoothie next door? I feel like gaining confidence comes with any yoga practice as you better get to know your body. But when your instructor has time to praise your alignment or celebrate the fact that you finally hit the pose you’ve been working on for months—because she knows how hard you’ve been working—it gives you a surge of confidence and a desire to keep improving your practice. Of course, you could list a number of reasons why small studios aren’t perfect, limited class offerings and times topping the list. But the pros outweigh the cons for those of us looking for something a little more intimate, something a little more personally involved. Whether you choose a big yoga studio or a small one, be sure to thank your teachers for giving of themselves. They are the ones who truly make or break a studio. Jenna Hatfield is an editor, writer, and storyteller. She also loves to capture little moments of daily life with her camera. 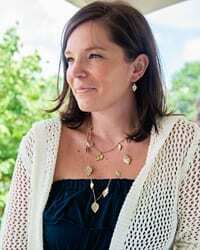 She blogs at Stop, Drop & Blog and has also worked as a photographer, though currently she prefers photographing her two sons, her husband, their zany German Shepherd, and six bossy chickens. Beyond writing and photography, Jenna also enjoys running (currently training for her second full marathon), cooking, and reading all the books. You can follow Jenna on Twitter and Instagram.